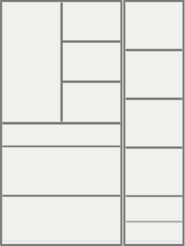 This wardrobe fits well against a dull colored wall. 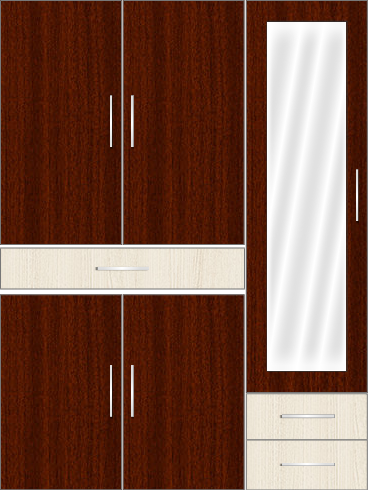 Shades like Mahagony with Comely Teak used in the shutters of the wardrobe gives a rich and elegant look as well. With this design people can have a rich and classy wardrobe at a very affordable price. The wardrobe is designed with a mirror in the rightmost door, having in mind, to use it even as a dresser. The wardrobe is also provided with a couple of external pullouts. The pullout by default comes with locks, providing a secure storage to your personal stuff. Interior: Storage of huge items in the wardrobe is made to be much easier than the traditional ones with removable partitions design. The wardrobe is designed with internal drawers to store valuables securely with embedded locks. The wardrobe can also be used a dressser in addition to the storage of attires.